Deckchairs designed to raise funds for World Land Trust (WLT) had their first public outing at the Chelsea Fringe. 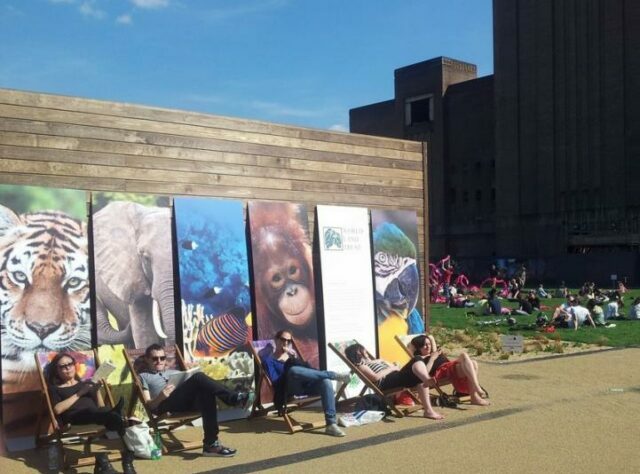 Next to the imposing Battersea Power Station, and in front of WLT’s colourful displays, visitors to the Chelsea Fringe were invited to ‘Sit to Make a Stand’ in deckchairs especially designed for the Trust. The Sit to Make a Stand Collection has been created by WLT in collaboration with University of Southampton’s Winchester School of Art and Southsea Deckchairs. Textile designs for the chairs were created by Winchester School of Art students who drew inspiration from WLT’s conservation projects. Sarah Lewry designed the Coral Reefs chair, Jessica Walsh the Elephants chair, Shahnaz Binte Nazimuddeen the Orang-utans chair, Hannah Baker the Big Cats chair, and Rachel Iball the Parrots chair.